The crossover features Mitsubishi's latest bold front-end styling. 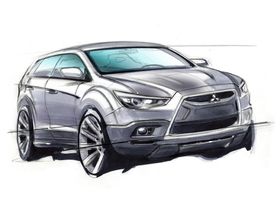 MUNICH – Mitsubishi has released a sketch of a new crossover that it plans to unveil at the Geneva auto show next year. The Japanese carmaker said European sales of the compact car will start early summer 2010. The car will debut in Japan in February. The U.S. will get a version starting in autumn 2010. Mitsubishi has not revealed the name of the model, which will be a rival to cars such as the Ford Kuga and Kia Soul. The crossover will be positioned below the Outlander SUV, which caused the motoring press to dub it a “baby” Outlander. The car is inspired by the 2007 cX concept, which was unveiled at the 2007 Frankfurt auto show. The new model will be based on the company's mid-sized platform that is already used to produce the Outlander and Lancer sedan. The crossover will also be the first Mitsubishi to get the company's new clean-diesel engine. The company says the model will be an important product to support its strategic shift from being an SUV-focused nameplate to a manufacturer of environment-friendly passenger cars and crossovers. Mitsubishi President Osamu Masuko is trying to revive the automaker with a lineup of fuel-efficient global models with an emphasis on electric and plug-in hybrid vehicles.